There are times when great nations face catastrophe. It is something that has befallen every world power at one time or another. Therefore it should not be a surprise if the United States despite the claims of those supporting American Exceptionalism succumbs to some great crisis which fundamentally changes it. While I do not proclaim the end of the United States it does appear that we are experiencing events which have the potential of reducing our status as a great power and plunge the nation into political and economic chaos. Some including California Governor Jerry Brown have compared the current state of the country to the division of the country in the American Civil War. Likewise since there are some leaders of the loud and influential Tea Party movement who openly talk about revolution it is important to know what can happen if there is a political or economic collapse that leads to revolution at home while troops are still in combat. All of this happened in Germany in 1918. In our current time such a possibility is higher than at any time in American History. Thus I feel we are in a potentially perilous time where long standing institutions are in crisis even while wars rage around the world. However I do not, for all the vitriol spent believe that our current crisis is comparable to the Civil War except the absolute contempt that the opposing sides hold each other. The Civil War was a war which pitted region against region and our divisions know few geographic boundaries and even the “Red State versus Blue State” divide is deceiving. It is my belief that what we are experiencing is much more similar to the crisis faced by Imperial Germany at the end of the First World War. 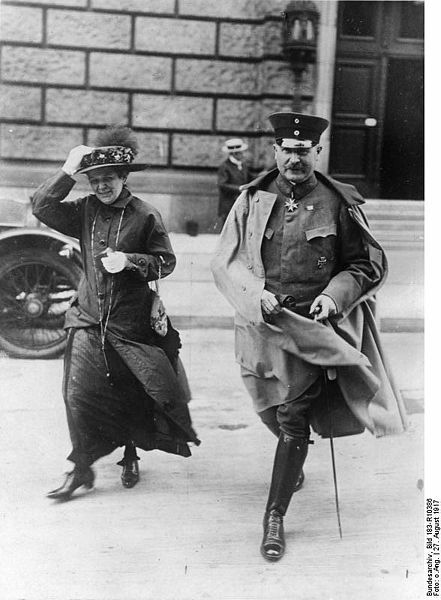 Then Germany was about to concede the loss of the war despite having known enormous battlefield success that lasted until the summer of 1918 when the tide of the war turned irreversibly against them as Allies collapsed and pulled out of the war was coupled with battlefield defeats, economic ruin and massive political and social unrest. The result of the collapse of Imperial Germany was a civil war and the foundation of the ill-fated Weimar Republic which eventually succumbed to the extremism and dictatorship of Adolf Hitler and his National Socialist Party of Germany, the Nazis. The German Revolution of 1919 and civil war is important for those who study highly developed states when they enter a period of social and political upheaval usually following military defeat that causes the society to question or even overthrow the established order. The end of Imperial Germany and the establishment of the Weimar Republic on November 9th 1918 is a prime example. This paper concerns the first years of the Republic, and the dependency of the Majority Socialist leadership to the General Staff and their use of Freikorps to quell revolutionary chaos and avert the establishment of a Soviet State. This study begins with the establishment of the Republic and concludes with the Kapp Putsch. This is an era that is seldom referenced by political or military leaders in western states and historians themselves are often divided in their interpretation of the subject. The study of this period is vital to those who study politically polarized societies which are either war weary or have suffered the shock of military defeat coupled with a government which is blamed for the events. Thus, it is important to study the relationship of the military to the government and in particular the military’s relationship to politicians who have little connection to or affinity for the military, its traditions and culture and the often adversarial relationship of these politicians to military leadership which often sees them as adversaries. The period also shows how actions of those who in their antipathy to the military create a climate where the military loathes the civilian leadership and the government. The results of such conditions can endanger the society as a whole and ultimately usher in periods of great tragedy. This occurred in Weimar Germany with the result that the military in the later years of the Republic neither the military nor the Majority Socialists could not work together against the Nazi takeover of the state. However, the first years of the relationship set the tone and foredoomed the Republic. It is true that without Freikorps support in Munich, along with support of the Thule Society, business leaders and others “that the transition of the DAP into the Hitler party could not have taken place.”[v] It is also true that elements of the Freikorps branded too revolutionary and unruly for service in the Army continued as secret societies and affiliated themselves with various right-wing political groups. [vi] Likewise a case can be made that the fierceness of many Freikorps veterans, younger leaders of the Army helped lay the foundation for the brutality of both the Army and Waffen SS as they prosecuted the Second World War. [vii] Yet simply because certain aspects of a subject are true does not make for a broader “truth.” Heinz Höhne argues the reverse of what some have written in regard to the relationship of the Freikorps and Reichswehr to the Nazis, that in fact the Nazis did not issue from the Freikorps, but rather that many former members of the Freikorps, Imperial Army or the Reichswehr were attracted to the Nazis, particularly to the SS by its “philosophy of “hardness” and its attitude of bellicosity per se, basically unconnected with ideology.”[viii] Others historians state similar views especially those that study the relationship of the Reichswehr leadership to the Freikorps. Thus the thesis of this paper is that the historiography like the period itself is complex; that the composition, leadership and motivations of the Freikorps were not monolithic, nor were they beloved by the Reichswehr, nor were they the “trailblazers” for the Nazi movement. The focus of this paper is on the relationship of the Reichswehr and the Freikorps to the Republic to the Kapp Putsch and the dangers of a relationship built on necessity without mutual trust. Such a relationship is dangerous and can lead to unintended consequences. 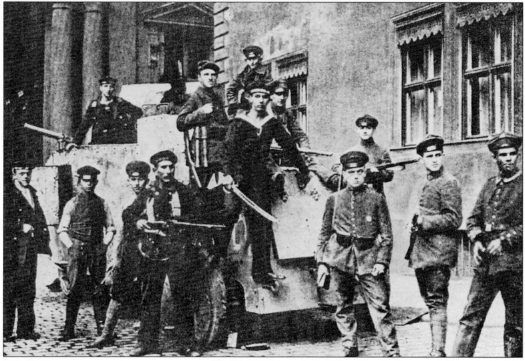 This paper will explore the first years of the Weimar Republic and specifically look at several key events that were pivotal in the relationship between the Army and Freikorps and the Majority Socialists. The literature covering this period includes both well written academic histories and popular works which attempt to present a particular view. Additionally there are biographical works which shed some light on the subject. The Reichswehr and the German Republic 1919-1926 by Harold Gordon Jr. is perhaps the best study of the Freikorps and their relationship to the state and the army. Gordon’s work is exceptional in documenting the numbers, types, political affiliation, action and ultimate disposition of the Freikorps. The History of the German General Staff by Walter Goerlitz; The Nemesis of Power: The German Army in Politics 1918-1945 by John Wheeler-Bennett, The Reichswehr and Politics 1918-1933 by F.L. Carsten and The Politics of the Prussian Army: 1640-1945 by Gordon A. Craig are all extremely valuable in exploring the relationship between the military and the Republic. The best of the general histories of the period, which focus on the National Socialist state are The German Dictatorship by Karl Dietrich Bracher, and Richard Evans’ The Coming of the Third Reich. Richard Watt’s The Kings Depart is one of the best for telling the story of the fall of the Empire and the revolution in Germany. Watt’s account is well written and documented work and touches on other factors affecting the new republic including Versailles and Allied political actions. The final chapter of Holger Herwig’s The First World War: Germany and Austria-Hungary 1914-1918 gives a good account of the Army’s role in the end of the Empire and beginning of the Republic. Andreas Dorpalen’s Hindenburg and the Weimar Republic adds an interesting dimension of Hindenburg’s role in the republic’s formation and negotiations between Groener, Noske and Ebert. Steven Ozments’ A Mighty Fortress is superficial in its treatment of the period. Nigel Jones’ Birth of the Nazis: How the Freikorps Blazed a Trail for Hitler is an interesting and somewhat entertaining but not very well documented tending to “broad brush” in a sensational way the Freikorps having none of the detail or nuance of Gordon, Craig, or Carsten on the Freikorps, nor the depth of Goerlitz or Wheeler-Bennett on the Republic’s relationship with the Army, or the attitude of the Reichswehr leadership to the Freikorps. William Shirer’s The Rise and Fall of the Third Reich, Gerald Reitlinger’s The SS: Alibi of a Nation 1922-1945 and Heinz Höhne’s The Order of the Death’s Head all add some information which details early Nazi involvement in the period, but are less useful to this early period most of their work focuses on later events. Of other works, Kenneth Macksey’s Why the Germans Lose at War has an insightful but short chapter dealing with this period and Wolfram Wette’s The Wehrmacht: History, Myth, Reality offers an interesting and at times provocative look at anti-Semitism in the German military in the years following the First World War. Carlos Caballero Jurado’s The German Freikorps 1918-1923 is a short but very detailed study of those organizations and their actions. B.H. Liddell-Hart who has a small chapter on General Hans Von Seeckt in The German Generals Talk which though it does not deal with the events in this paper make for interesting commentary on later actions of former Reichswehr officers who served the Nazi state. One thing that has to be noted about all the memoirs is that each of the writers was writing after the German Defeat and their imprisonment. Many times their words mask other actions and attitudes that are not mentioned, thus while an important source one also has to have some suspicions when using them even the unintentional errors that come from time as well as the human tendency to have a somewhat selective memory. This paper will first examine the formation of the Freikorps by the Army and the Ebert government in response to uprisings by armed groups of leftists and the effectiveness of the Freikorps in putting down the various uprisings. We will then address the relationship of the Army with the Majority Socialists and then move on to the crisis engendered by the Kapp Putsch. The High Command was able to bring the Army home in good order following the armistice but upon arriving most units “melted away like snow under a summer sun,”[xxv] those which remained were often shells of their former selves beset by soldier’s councils and leftist revolutionaries. To support the government the High Command issued a directive stating that it “put itself as the disposal of the present government led by Ebert without any reservation.”[xxvi] Yet in December delegates of the National Assembly continued to sow resentment in the military by military discipline be placed in the hands of soldiers’ councils, that all badges of rank be removed with all decorations of insignia and honor. [xxvii] Reaction was heated,[xxviii] but despite this Groener, Colonel Walter Reinhardt, the Prussian Minister of War and the Republic’s Defense Minister, Gustav Noske endeavored to find forces to combat the growing revolution and rebellious military units. 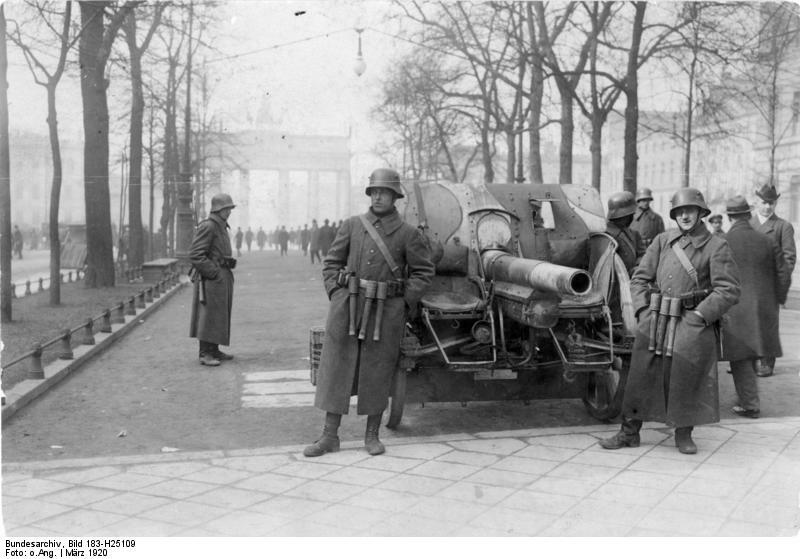 The choice was not hard, the Army was of no use, so called “democratic forces” were in most cases both unreliable and ineffective, while only the Freikorps “provided suitable material for the immediate creation of an efficient, combat-ready army.”[xxix] Thus the Freikorps became the instrument of necessity to ensure that the government was not swept away by a Soviet style revolution. The period was a critical and complex and should be studied by anyone living in a state with a powerful military tradition and institutions in crisis. Unlike popular notions, the Freikorps were diverse and not the seed-bed of the Nazi movement and though many former members would become Nazis. Several, including Ehrhardt narrowly escaped death at Nazi hands. 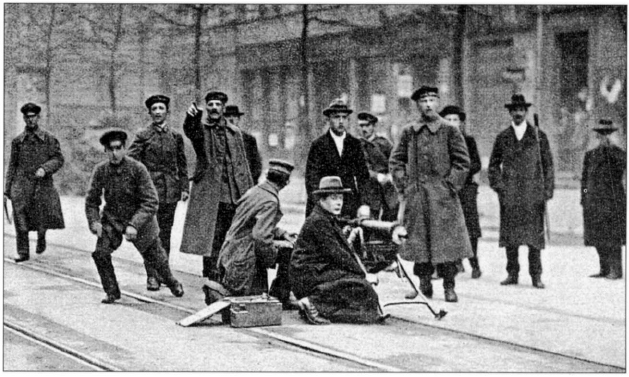 [lxiii] Freikorps were viewed by Army leadership as an expedient force that could not remain in the service once the Army was functional. Key lessons include that the military cannot become a “state within a state,” and that both military and civilian leaders must seek to bridge any gulf that separates them in times of crisis. 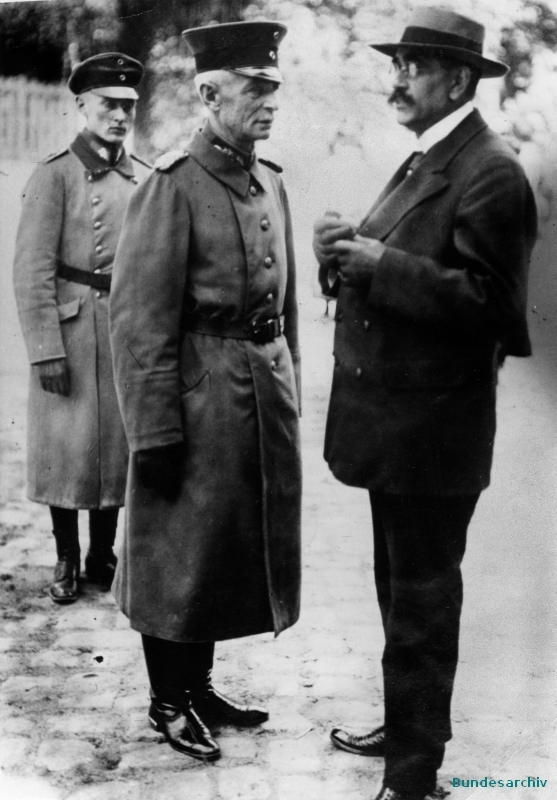 In Weimar both the military and the Socialists thoroughly distrusted one another with the result that they eventually, despite early success[lxiv] worked against each other in later years. Actions by both Socialists and the military ultimately subverted the Republic and ensured its demise and Seeckt’s policy of separation from politics “tended toward a renunciation of the soldier’s potential restraining influence on adventurous statesmen.”[lxv] Such is the fateful lesson for today. [i] Jones, Nigel. The Birth of the Nazis: How the Freikorps Blazed a Trail for Hitler. Constable and Robinson Ltd. London, U.K. 1987 and 2004. This is Jones assertion and he attempts to make the tie using careers of some individuals who served both in Freikorps and either in the Nazi Party or Military and attitudes common in many Freikorps with similar attitudes found in the Nazi movement. The 2004 edition of his work includes an introduction by Michael Burleigh echoing his sentiments. [ii] Evans, Richard J. The Coming of the Third Reich. Penguin Group. London, U.K. and New York, NY. 2003. pp.227-229. Evans discusses the fact that the Nazis did have a number of Freikorps veterans but at no point makes the connection that the Freikorps are a direct ancestor. [iv] Gordon, Harold J. Jr. The Reichswehr and the German Republic 1919-1926. Princeton University Press, Princeton NJ 1957. Gordon’s work is perhaps the most detailed study involving the Freikorps and the Reichswehr. He is exceptional in discussing the relationship of both with the various political parties including the Nazis. He refutes this assertion throughout the book. [viii] Höhne, Heinz. The Order of the Death’s Head: The Story of Hitler’s SS. The Penguin Group, London U.K. and New York, NY 1969. Translated by Richard Barry. Originally Published as Der Ordnung unter dem Totenkopf. Verlag der Spiegel, Hamburg, 1966. p.54. [ix] These include Macksey’s biographies of Kesselring and Guderian , Richard Giziowski’s The Enigma of General Blaskowitz. Peter Padfield’s Dönitz: the Last Führer, David Fraser’s biography of Field Marshal Rommel Knight’s Cross, Messenger’s work on Von Rundsedt, The Last Prussian, and Höhne’s Canaris: Hitler’s Master Spy all provide brief but interesting views of the actions and attitudes of these officers during the revolution and during the Weimar period. [xii] Gordon, Harold Jr. The Reichswehr and the German Republic 1919-1926. Princeton University Press, Princeton, NJ 1957 pp.4-5 Gordon recounts the story of an entire replacement train revolting when it reached the front which had to be disarmed by a shock battalion. [xvii] Carsten, F.L. The Reichswehr and Politics 1918-1933. Oxford University Press, Oxford, UK 1966 p.6. It is noted by a number of author’s that Groener did this, to maintain the unity of Germany and prevent its division. [xxii] Craig, Gordon A. The Politics of the Prussian Army 1640-1945. Oxford University Press, Oxford, UK 1955 pp.347-348. Craig gives an interesting account noting the Groener’s call to Ebert shows recognition of the legitimacy of the new government and notes that the offer was somewhat conditional. [xxvii] Ibid. Carsten. p.18 Carsten produces the bulk of the English translation of these points and notes that the anti-military feeling had become widespread. [xxxi] Ibid. Gordon. pp. 19 and 24. This was the 1st Marine Brigade, or Brigade Von Roden of which elements would later serve in under the command of other Freikorps such as the Guards Calvary Rifle Division. 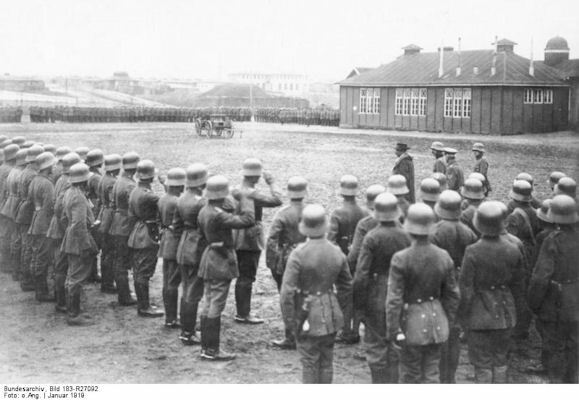 [xxxvii] Thee forces included the Landesjaegerkorps and Guards Cavalry Rifle division. [xl] This was one of two additional Naval Brigades formed by Noske after the success of Naval Brigade Von Roden. 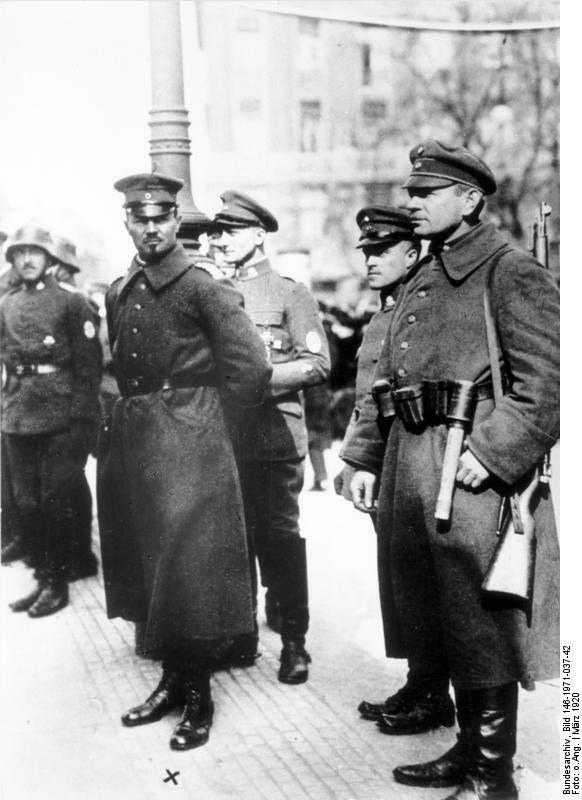 It was one of the most combat effective but unfortunately violent and radical of the Freikorps, it would as we will see be a key unit in the Kapp Putsch but would not be absorbed into the Reichswehr. [xli] This unit was not a Navy unit at all but was composed of many who were criminals and other rabble. See Gordon, Carsten and Watt. [xliii] Ibid. Gordon. p.42 His units were known as Security Companies. [xlv] Ibid. Gordon. pp.47-49. An estimated 550 people including 200 innocent bystanders were killed in the fighting. [liii] Ibid. Carsten. p.76 Another consideration is that Noske, Reinhardt and Seeckt all were seeking to retire Lüttwitz. [lix] Among them Maercker who had been such a strong supporter of the Republic in the early days. [lxi] Raeder, Erich. Grand Admiral. Translated from the German by Henry W. Drexell. United States Naval Institute, Annapolis MD, 1960. Da Capo Press edition published 2001. p.111. This is interesting as almost all histories implicate the Navy High Command of either some complicity or at least agreement with the Putsch participants. [lxii] The final part in the drama would come when General Kurt Von Schleicher became the last Chancellor before Hitler. 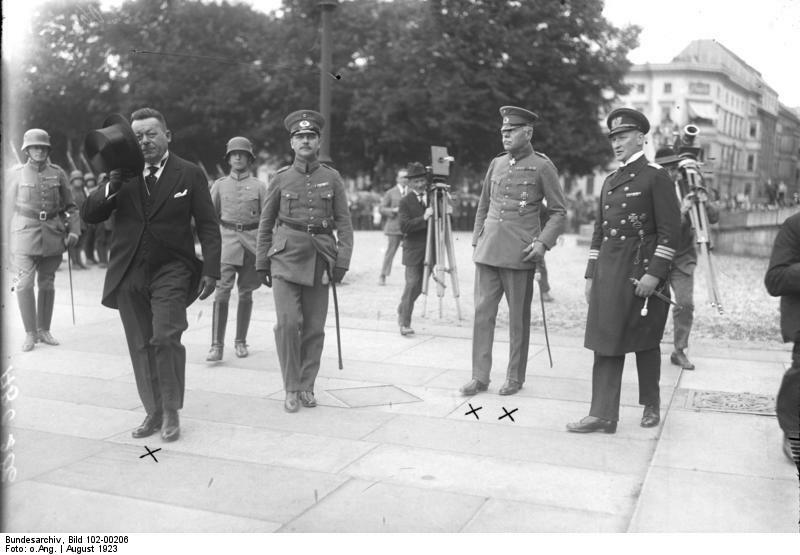 Schleicher had assisted Groener and Noske in the early days of the Republic and often attempted to use the Army’s influence in politics. He was fatally short sighted and was a victim of the SS “night of Long Knives” which was directed against the SA. [lxiii] Ibid. Jones. p.266 Others such as Gerhard Rossbach had similar experiences. Korvettenkapitän Löwenfeld of the 3rd Naval Brigade became an Admiral, Wilhelm Canaris , who was implicated in the Kapp Putsch but kept his career would later head the Abwehr and die in a concentration camp. [lxiv] Ibid. Gordon. p.426 Gordon has a good discussion of this topic in his conclusion. 65 Liddell-Hart, B.H. The German Generals Talk. Published 1948 B.H. Liddell-Hart, Quill Publications, New York, NY. 1979. p.18 Liddell-Hart’s analysis of the results of the Reichswehr’s disconnection from the larger society and political process is remarkable due to current trends in the American military which like the Reichswehr has become somewhat more conservative and disconnected from society, exceptionally technically proficient but not adept in politics or grand-strategy. Bracher, Karl Dietrich. 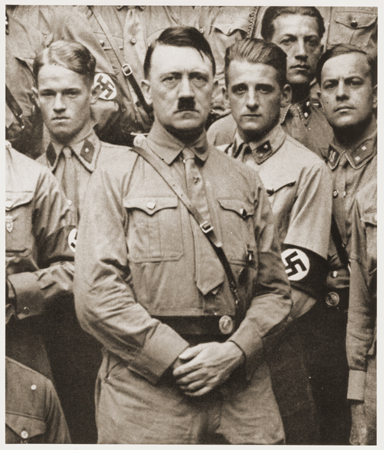 The German Dictatorship: The Origins, Structure and Effects of National Socialism. Translated from the German by Jean Steinberg with an introduction by Peter Gay. Praeger Publishers, New York, NY. 1970 Originally published in Germany as Die deutsche Diktator: Entstehung, Struktur, Folgen den Nationalsozialismus by Verlag Kiepenheuer und Witsch. Koln und Berlin. Höhne, Heinz. Canaris: Hitler’s Master Spy. Cooper Square Press, New York, NY 1979 and 1999. Translated from the German by J. Maxwell Brownjohn, Originally published in Germany by C. Bertelsmann Verlag Gmbh, München. 1976. Höhne, Heinz. The Order of the Death’s Head: The Story of Hitler’s SS. The Penguin Group, London U.K. and New York, NY 1969. Translated by Richard Barry. Originally Published as Der Ordnung unter dem Totenkopf. Verlag der Spiegel, Hamburg, 1966. Kesselring, Albrecht. The Memoirs of Field Marshal Kesselring with a new introduction by Kenneth Macksey. Greenhill Books, London UK. 1997. Translated from the German by William Kimber Ltd. Originally published as Soldat bis zum letzen Tag. Athenaum, Bonn, Germany 1953. Macksey, Kenneth. Kesselring: The German Master Strategist of the Second World War. Greenhill Books, London, UK 2000. I didn’t mess up the Abbess’s Birthday this Year…Cheers! I am terrible at doing birthdays…mine included. Unfortunately this can be detrimental in my primary and many other relationships. In particular I have made my fair share of messes when it comes to birthdays, especially those of Judy. This began shortly after marriage and there have been a number of times that I regret, especially in choice of gifts. A large part of this was due to selective hearing on my part in what she wanted and to what she would refer to as the “damage to the brain caused by the male hormone.” The biggest of the goofs was when in seminary I got her the Bible that I wanted…not smart. I will not add to the fire of my self-immolation here by describing the others. I can say that like a pitcher has hung one too many curveballs in the center of the plate to good hitters and seeing it go over the fence, the memories flash through my mind beginning in the middle of September until the birthday is successfully negotiated. It is like making sure that I get the last out before I can rest. This year went well. In fact it has been like an extended celebration for her milestone birthday. We brought her college roommate here for 6 days, we had lunch with her friend Diane and dinner at Gordon Biersch together and breakfast today with her friend Pat and her father today. Saturday evening we will make the close to the week by having a number of people over for dinner and cake. Even the gifts that I chose were things that she wanted or actually liked. The key to me successfully negotiating a birthday is to actually listen to what she wants. We have had a couple of good days of leave and enjoyed our time together. The cool thing is though she has reached this milestone, she neither looks nor acts her age. Since I neither look nor act my age most of the time, though I am feeling it more, I think that we are a good match. At the same time the week has seen my “Closet of Anxieties” open up again. Part is obviously PTSD induced and part life induced. My mom as always has managed to add stress to my life. My dad continues to slowly circle getting worse in the nursing home. My German friend wants me to come to Germany in early December but I am nervous about making the flight. I was able to handle flying much better before Iraq. Finally I am concerned about things going on in the country as some people on the political right are advocating a military coup or violent revolution to overthrow President Obama. The scary thing as these are not people on the nutty fringe but people more in the mainstream of current conservative thought. What is even more alarming is that a lot of these folks are also prominent Evangelical Christians. One should never forget that many German “conservative Christian values voters” supported Hitler because they so hated the left. Hitler, like many right wing politicians in this country played to their fear and hatred of the left for their political support. I’m afraid of the same thing happening here. To me the political situation is looking more like the Weimar Republic every day and unlike the folks cited in the article I don’t see President Obama as a Nazi or Marxist. I think that people are playing with fire in suggesting bloody revolutions or military coups. If either happens there is no going back. They will have to coin a phrase “destroyed the Constitution in order to save it.” What is scary for me to see a national columnist like John Perry writing in the mainstream conservative news online publication Newsmax.com , suggest a military coup when the military is engaged in two wars. The military is perhaps the most trusted institution in the country and to look to it in time of war to overthrow the government in a partisan action is madness and even borders on treason. Even if this Wolfgang Kapp wannabee was able to get some misdirected military leader to pull a Lüttwitz[i] and attempt to seize power. Such an attempt would be futile and doomed to failure. Such an attempt could never gain the support of the entire military and would be dependent on many younger soldiers, sailors, airmen and Marines who do not necessarily support the or are as radical as those pushing this on the political right. The military is not a reactionary or monolithic institution despite the wishes of some on the right. When one sees this kind of talk combined with street brawls at political town meetings and people carrying semi-automatic weapons at rallies where the President is speaking one sees a recipe for disaster that could destroy the country. If this continues and at best poison the political and social atmosphere for decades to come. I felt the same way when people on the left suggested a military coup against President Bush a couple of years ago. We have a political process that has worked relatively well for 200 plus years. Yes we are divided and having problems but nothing is insurmountable if we decide to work and play well with each other. We have survived as a nation so long precisely because we have had the wisdom to step back from the brink, with the exception of the Civil War and we all know how well that turned out for everyone concerned. However tonight a final source of anxiety was lifted when the Orioles broke their 13 game losing streak against the Tampa Bay Rays tonight. O’s lefty Chris Waters, who I have met a number of times in Norfolk got the win and Jeff Fiorentino came up big with a 2 out RBI single that provided what would be the winning run. It was good news for both players, Waters needed the win just to regain confidence and hopefully get another look by the O’s and other teams. Fiorentino is now being talked about as having a place on the 2010 Orioles. He certainly has earned it. With the win the Orioles go home to the confines of Camden Yards to finish the season against the Blue Jays. Note: The last time I posted something about faith and politics I had a couple of really nasty and personal comments by those on the right all but calling me a non-Christian and Marxist traitor. This should be fun. [i] Wolfgang Kapp was a German politician who worked with disaffected radical elements of the Army to attempt to overthrow the Weimar Republic in 1922. He gained the support of General von Lüttwitz who commanded the military district around Berlin and used a radicalized Freikorps, the Erhardt Brigade which was slated by the Army for demobilization to attempt to seize control of the government. The attempt floundered but hindered future cooperation between the Army and the Majority Socialists where the Nazis began their rise to power.